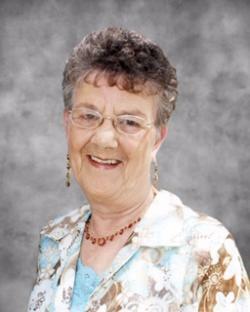 SAINT-LOUIS-DE-KENT, NB – Zelica Babineau 87, of Saint-Louis-de-Kent passed away peacefully at the Stella Maris Hospital, Ste-Anne-de-Kent on Thursday, February 7, 2019. Born in Guimond Village, she was the daughter of the late Philias Martin and late Emma (Babineau). She was a member of the St-Louis Golden Age Club and attended St. Louis des Français Roman Catholic Church in St-Louis. Zelica will be sadly missed by her husband, Firmin Babineau of St-Louis; three daughters, Claudette Babineau of Bouctouche, Pierrette Johnson of Richibucto, Della Maltby (Dave) of Edmonton, AB; four sons, Jean-Claude Babineau (Denise) of Bouctouche, Pierre-Yves Babineau (Francine) of St-Louis, Paul Babineau (Suzanne) of Petit-Rocher, André Babineau of Moncton; nine grandchildren and seven great grandchildren. She is also survived by one sister, Stella Gougeon (late Georges) of Montreal; one brother, Edouard Martin (Julie) of Acadieville and many nieces and nephews. Besides her parents, she was predeceased by two grandchildren, Christopher, Jean-Guy; three sisters, Roseline, Edmée, Aurore and three brothers, André, Colombin and Willie. Visitation will be held at Thompson Memorial Home, Saint-Louis-de-Kent on Monday from 2-4 & 7-9 pm, Tuesday at 2:00 pm until time of the funeral. A Funeral Mass will be celebrated on Tuesday, February 12, 2019 at 4:00 pm, St. Louis des Français Roman Catholic Church, Saint-Louis-de-Kent. Donations in Zelica’s memory may be made to the Stella Maris Hospital Palliative Care Unit and would be appreciated by the family. Arrangements are in care of Thompson’s Funeral Home, Richibucto (523-4252). Monday 2-4 & 7-9 pm, Tuesday at 2:00 pm until time of the funeral.